A relaxing stay at Kanuga is the result of many departments working faithfully behind the scenes to ensure every detail is perfect. 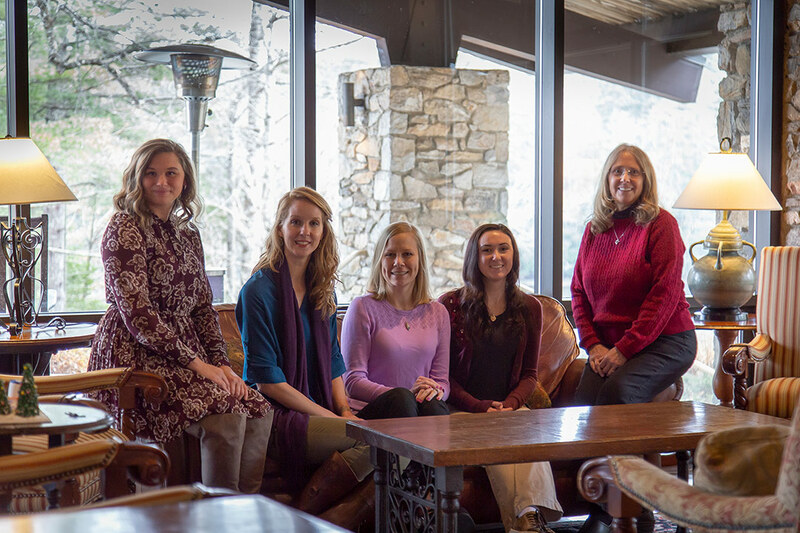 For many, the very first introduction to Kanuga’s warm and friendly atmosphere is an interaction with our hospitality staff. We were lucky enough to catch up with the team to discover what they love best about Kanuga. My role at Kanuga involves meeting and talking with people who want to plan a conference or retreat with us. It’s so intriguing because everyone is different, and it is neat to be able to see that. The best part about working on the hospitality team is the team itself. We work together and keep the bond strong between us. My favorite thing about my job is check-in day. Typically on the first day, I meet face-to-face with the coordinators I’ve been working with the past few months via phone or email. It’s nice when everyone comes together, and we’re able to put names to faces. I work with visitors and event coordinators on guest registration, housing needs, and catering numbers to create successful, organized retreats to Kanuga. I knew that Kanuga would be my home away from home when I learned about their vision of Service, Respect, Sustainability, and Stewardship. The best part about my job is seeing people come to Kanuga and renew their appreciation for our piece of creation. Although I love all seasons in the Blue Ridge Mountains, autumn is my favorite time at Kanuga. The crisp mornings, the songs of the migratory bird, and the colors of the leaves create a tangible magic in the air. My role at Kanuga is to assist guests with all of their housing needs and make sure all their questions are answered before they arrive. I enjoy working with all my co-workers on the reservations team and being surrounded by all the beauty Kanuga has to offer. Summer at Kanuga is my favorite season, because that’s when the campus seems to come to life. I love the fact that my job is fast-paced, but also includes balance. There’s always time to take a stroll down to the lake if we need a break during the day. I work mainly with Guest Period, so my job looks a little different from some of my other team members. My role is to be a resource for guests coming to our signature family program. Every day changes and every day we wear different hats and do different jobs. My favorite season at Kanuga is summer! It’s seven weeks of nonstop fun and fellowship. It is a time of year when staff and guests alike enjoy renewal and days packed with fun. The guests who come to Kanuga Guest Period have been coming for years. They make each day of work an unforgettable experience. My role is to work closely with the hospitality staff to provide training, guidance, direction, support, and encouragement. I bring 15 years of Kanuga history, knowledge, and experience to the team. I am a “people person” and love working as part of a team to accomplish common goals. I feel best when our goals are reached. I love seeing our guests feel welcomed by our staff and watching them experience the core values of Kanuga.